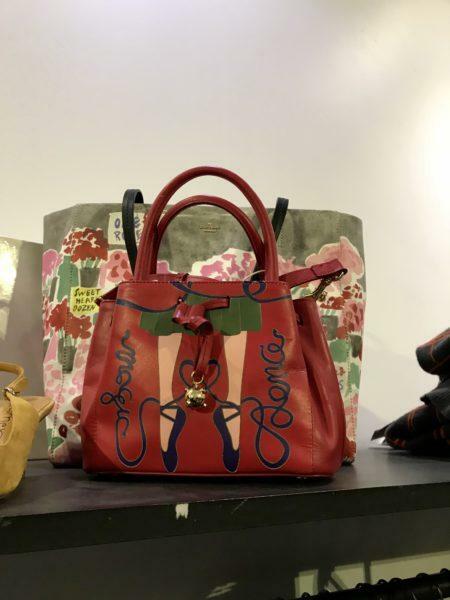 You don’t read much about Paris outlet stores and fashion discount shopping, but surprisingly they do exist and bargains can be found right in central Paris. 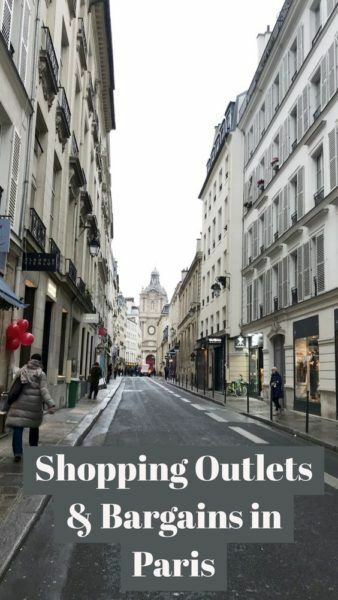 I wanted to write this post because everything I researched on Paris outlet shopping brought me to one resource– La Vallee Village, an outlet center outside of Paris. 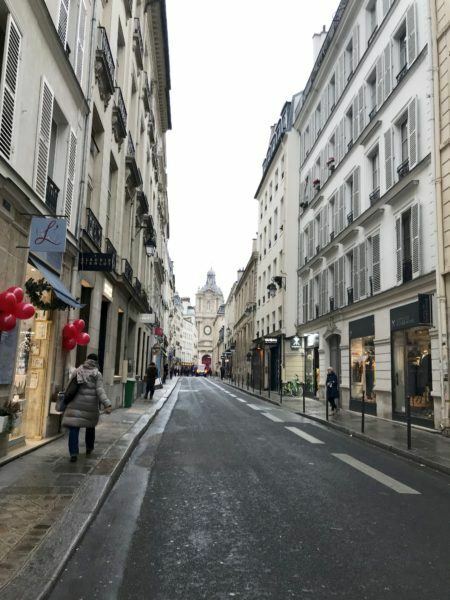 And while La Vallee Village might have great shopping, on this short visit to Paris, I just couldn’t justify taking a day out of my Paris vacation to leave the city to shop. 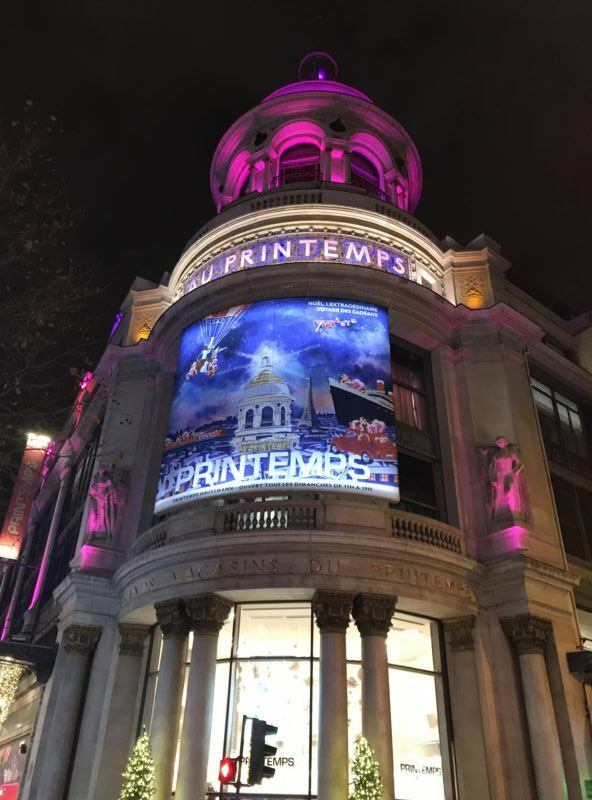 Fortunately, on my last trip to Paris I learned that you don’t have to leave Paris or even go out of your way to hit some amazing Paris outlet stores and find shopping bargains. In the course of sightseeing and strolling Parisian streets, I stumbled upon multiple fashion outlet stores right in the heart of Paris. For bargain hunters like me, finding Parisian outlet and discount stores is kind of critical because i) Paris fashion, while gorgeous, is crazy expensive and ii) sales in Paris (called les soldes) are scarce, occurring only twice a year. Second, I provide a photo walk through of Parisian outlet stores I visited on this trip, along with a list of other outlet stores that I didn’t make it to, but looked like they might be worth a visit. What’s the Deal with the Twice-Yearly Sales in Paris Stores (les soldes)? Are there off price discount stores like TJ Maxx in Paris, France? Does Paris have thrift stores like Goodwill? Is there an outlet mall in or near Paris? Are there any Stock or Outlet stores in the heart of Paris? From what I’ve read online, in France (not just in Paris) sales are actually state regulated and only happen twice a year. In the summer, the Paris sales/les soldes start around the end of June, just before Parisians take their annual extended summer vacation. In the winter Paris sales start shortly after Christmas, around January 10 or so. Paris winter and summer sales run for about six weeks each, with prices getting progressively cheaper as the period runs by. In large Parisian department stores like Printemps, don’t expect constant sales like we see in the United States. Sales happen only twice a year. I really tried to find out what it was like to actually shop these twice yearly sales. But online “advice” was super generic and clearly written by people who had never attended a sale and knew nothing about shopping (e.g. beware the crowds!). Unfortunately I haven’t been in Paris during these time so I can’t shed light on whether it’s actually worthwhile to visit Paris expressly to shop the summer and winter sales or not or not, but if you have, please share your wisdom in the comments! Finally, while everything I read indicated sales only happen in Paris twice yearly, I’m not sure how accurate that is. 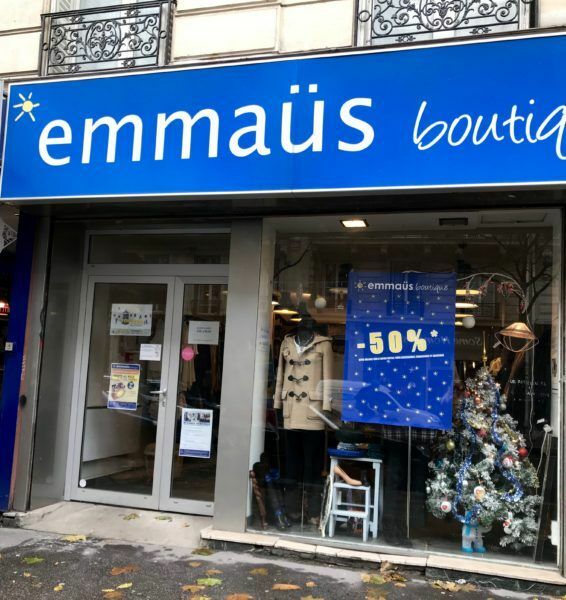 I visited Paris the first week of December 2017 and encountered several “liquidation” and “les soldes” signs, so I can’t tell if certain kinds of sales are allowed year round or not. Update: a reader helpfully shed some more light on the sales: “French stores cannot have sales like American ones….except twice a year. Any other times, price lowering can be done but must STAY lowered (not down one week and back up the next, like in the US). I took this photo the first week of December, 2017– outside of the customary Parisian twice yearly sales period. Note the prominent “liquidation” signage. Back home in New York, in addition to outlet stores and sample sales, I also shop off price stores like TJ Maxx. My friend who came to Paris with me has a TJ Maxx obsession. So it was only natural that we searched for the TJ Maxx of Paris. Afterall, the UK has the equivalent TK Maxx, so it seemed entirely plausible. Unfortunately, there does not appear to be any sort of TJ Maxx or equivalent that we could find. I am updating this post because a reader commented that the chain Tati might be comparable to TJ Maxx, “you never know what you’ll find there; junk mixed with off-season designer stuff, bins to paw through, etc. Some times you find nothing good, other times great (my experience with TJ Maxx as well). 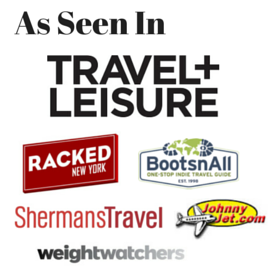 The stores are different from the online presence.” Thanks for the tip, can’t wait to check it out on my next trip! Yes! While vintage shops are sometimes but not always a great deal, and laborious to figure out the “good ones,” thrift stores offer the best bargains. In the Paris thrift store we discovered, I found barely worn Manolo Blahniks on sale for 40 euros, among other things. Read all about it in my last post here. Emmaus not only provides great prices, but is an amazing charitable organization with works with the homeless. If you google “Paris outlet shopping,” you’ll be directed to articles written about La Vallee Village. La Vallee Village is one of those faux village outlet centers with designer shops (while I haven’t visited, the premise looks very similar to typical outlet stores in the United States). I scanned the store list at La Village and was impressed that it was mostly French brands, some of which do not have any US outlets. I also liked that the concessions included tempting French favorites Lauduree and La Maison Du Chocolat. While I wouldn’t mind checking out La Vallee Village on a long stay in the area, I wasn’t interested in dedicating an entire day to shopping outside of Paris. Getting there is a bit of an ordeal. La Valle Village runs their own express shuttle service which appears to be the best way to get there, but that takes 45 minutes. Add on the time it takes to get to the limited shuttle pick up points, and the better part of your day is pretty much gone. 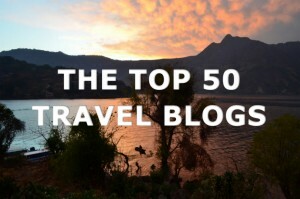 Despite dedicating an entire blog to travel shopping, I don’t believe in going far out of my way to shop– I try to stick to convenient options that are near sightseeing and places I would go to anyway. Rue de Sévigné in the Marais has several women’s fashion outlet shops mixed in with standard stores. It’s a picturesque street worth a stroll (with a delicious crepe restaurant), not far from Place do Vosges. Now we get to the question that I haven’t seen answered anywhere else. Yes, outlet stores do exist in the heart of Paris, conveniently in the shopping district (and adorable neighborhood of) the Marais. 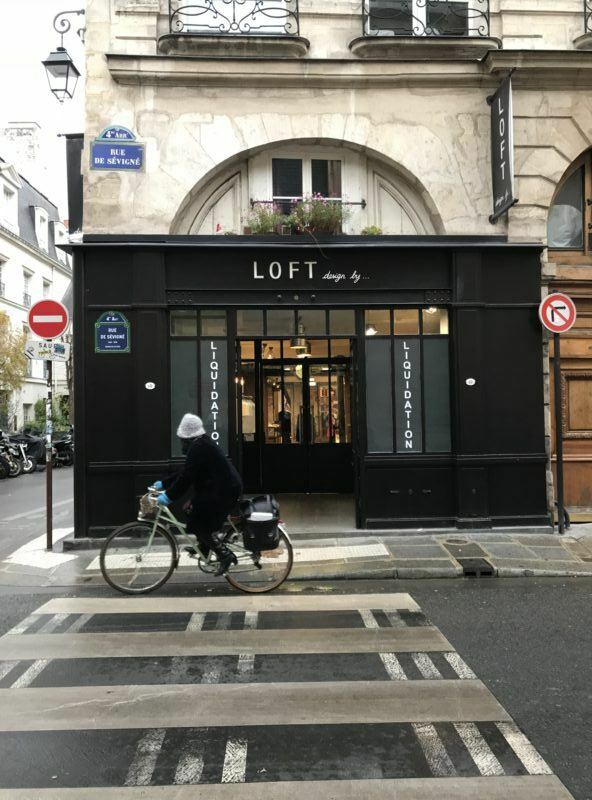 Our airbnb was located in the Marais (an area I highly recommend to stay in, to get a $40 discount on your first Airbnb stay, click here to use my referral). My favorite part of staying in the Marais was wandering the picturesque streets. We used no map or shop lists– in the course of our ambles we started to notice certain shops had signage “outlet” or “stock” (how outlet stores are usually designated in France). We found some outlet stores that were brand specific, others that carried multiple brands. 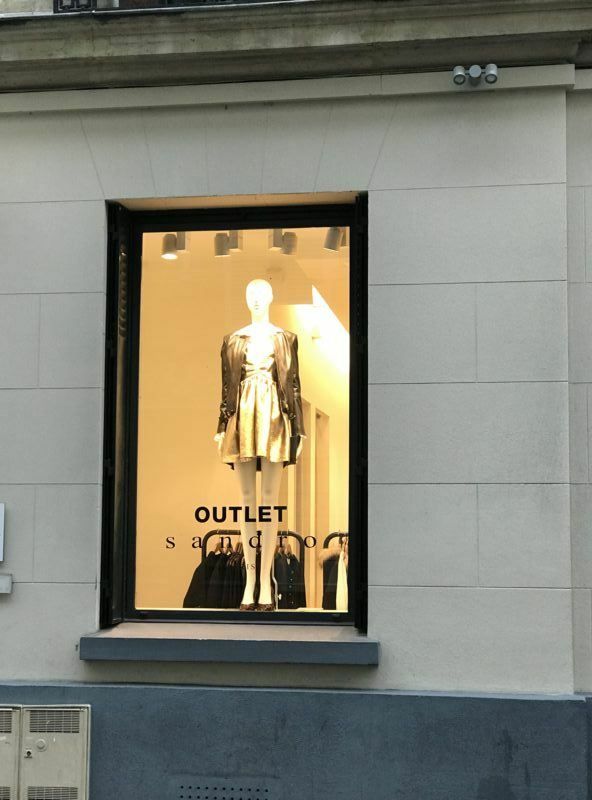 A high concentration of outlet stores happen to be in the Marais, though through further research I found some outlet stores in other locations as well. It was hard for us to miss L’Habilluer, as it was half a block from the Airbnb we rented in the Marais. Nothing on the outside of the shop indicated this was an outlet store, but as we went inside in search of gloves, it was clear that L’Habilleur is an off-price/outlet store. 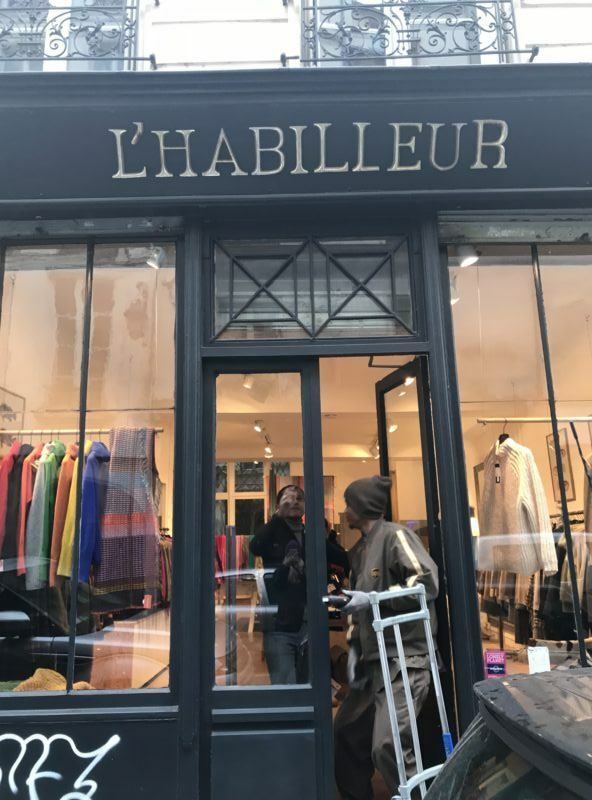 L’Habilleur is a lovely store, full of high quality and well curated fashion merchandise from multiple European brands. There were separate rooms for men and women’s fashions. I recognized a few of the brands (I was thrilled to see cast offs from Avoca, an Irish shop that I wrote about here). Prices were about 50% off. The elegant shopfront of L’Habilleur Paris, in the Haut Marais. We checked out the gorgeous cashmere gloves at L’Habilleur, marked at 50% off. Back home in New York, I love scouring department store sale racks for Sandro pieces. Sandro feels like classic French with a twist and never too trendy. Sandro prices are pretty reasonable even at full-price, so discounts make them very affordable. 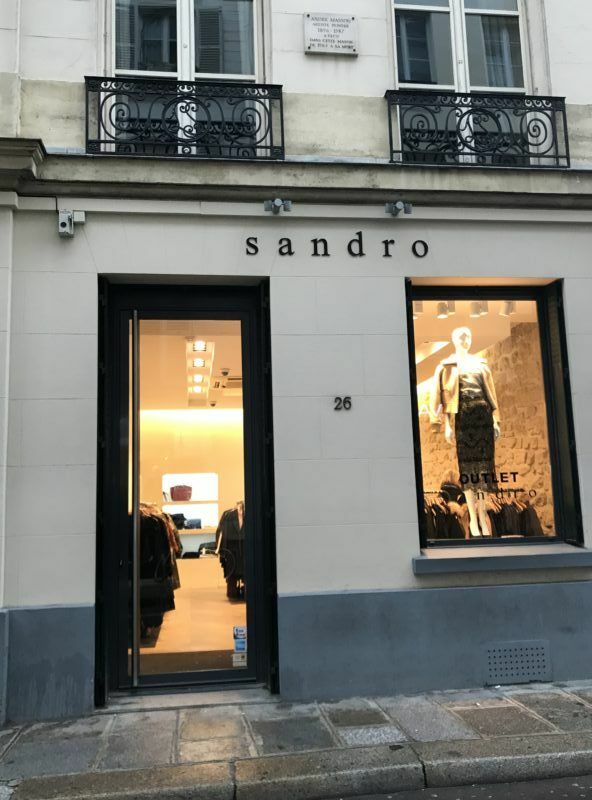 We almost missed this outlet store in the Marais, assuming it was a regular full-price Sandro. The Claudie Pierlot outlet is all about chic French staples like peter pan collars and breton shirts. Prices are fair, nowhere near high end designer prices. Very affordable with discounts of 30-50%. We eyed the gorgeous coats here. Chic Parisian dresses at the Claudie Pierlot outlet in Paris. Even the scarves and accessories were gorgeous at the Claudie Pierlot outlet in Paris. 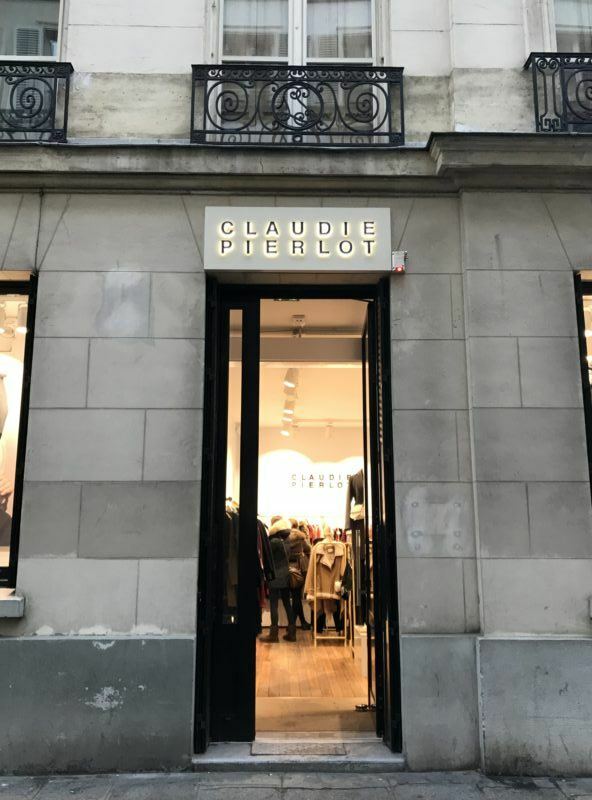 Shopping the Claudie Pierlot outlet in Paris and finding huge discounts on women’s fashion. Shopping tfor bargains at the Claudie Pierlot outlet in Paris. This large multibrand store is packed with high-end European designers like Valentino, Dolce & Gabbana, and Versace. Discounts clearly marked by percentage on the signs on the racks. While the discounts were pretty good at 30-50% off, keep in mind these clothes have very high starting points to begin with. La Piscine Bourgeois Outlet Store Marais has discounts ranging from 30-50% off high end designers. Construction blocked the entryway here. Loads of designer clothing to look through. Because of time constraints (and also the fact that we sometimes walked by at night when the stores were closed) we didn’t go into every outlet store we came across. Here are some others (at least as indicated by the “stock” or “outlet” designation on the window). My list is by no means comprehensive, so if you know of other outlet stores to add, please let me know! We didn’t go in this shop in the Haut Marais down the block from our b and b as it was closed, but I did snap a photo of the shopfront. I assume “stock” means outlet. I adore this edgy Parisian brand and have several pieces (jeans, cute tees) I bought in New York. 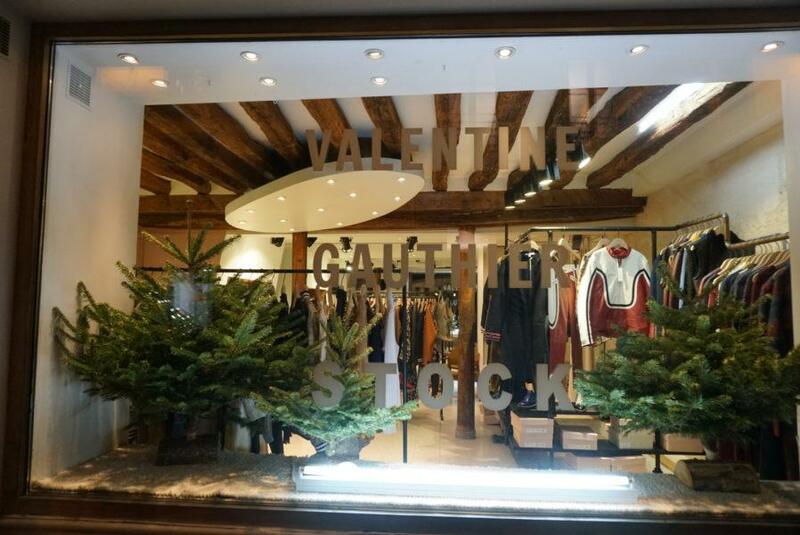 Unfortunately, I totally missed the Zadig & Voltaire outlet in the Marais, but reductions are supposed to be about -30 to -60%. Alaia is serious designer couture stuff at stratospheric prices. I was surprised to hear there was an outlet here, but to be honest I would probably be still too intimidated to visit (not that I could afford even heavily discounted Alaia pieces). I did not check any of these out, but from what I could gather these outlet shops also exist. Sonia Rykiel has a very recognizable French style, especially her striped pieces. My Upper East Side neighborhood seems to have more fancy French baby stores than actual necessities like diners and bodegas, so I am a little biased against them. But if you’re going to spend inordinate sums on a child that will shortly outgrow her admitedly adorable dresses, you might as well get them on discount. Children’s clothes and shoes, from 0-16 years old. I love APC– everything about them screams French to me and I have a few simple but elegant dresses, coats and handbags. But I have never paid full price for APC– there is no need to when the NYC Soho store has epic sales and the NYC outlet/surplus stores are always well-stocked. 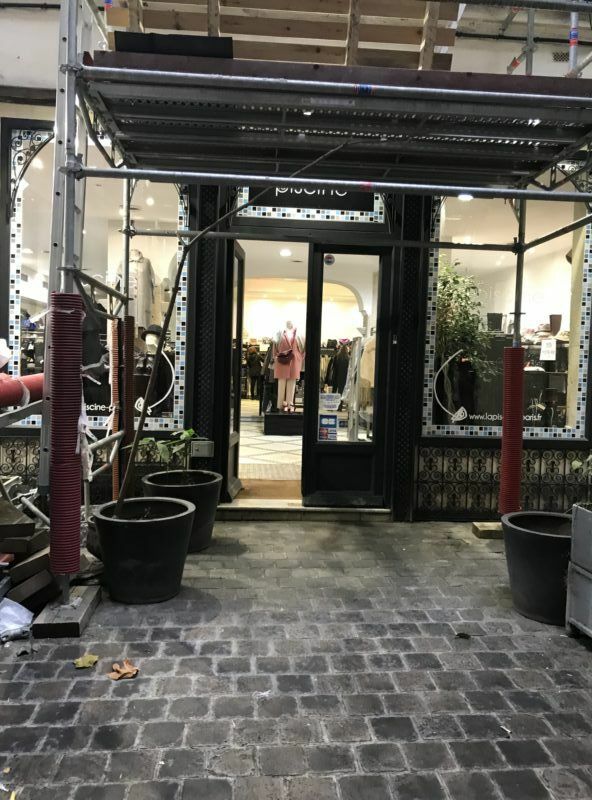 I wasn’t in the neighborhood to visit the Paris APC surplus store but I would be very interested to see how it compares to the NYC outlets in price and selection. I’ve seen this brand often but have never shopped it myself. Including here just because it seems popular and might be of interest to readers. Discounts of 30-70%. Chic, boho French– I’m familar with the brand from their NYC stores and would stop by if in the area. I usually shop the Comptoir des Cotonniers brand on sale at my NYC Bloomingdales. Prices around half off. Have you visited any Paris outlets or discount stores? Do you know how Parisian sales really work? Tell us about your experiences in the comments! I dot have a couple comments: You are right: French stores cannot have sales like American ones….except twice a year. Any other times, price lowering can be done but must STAY lowered (not down one week and back up the next, like in the US). So there will be Soldes and Liquidations signs but those prices will not go back up….what goes down, stays down. So they are more like clearance sales. Also: there is a chain I’d compare to TJ Maxx. Next time in Paris, check out a Tati https://www.tati.fr/ You never know what you’;ll find there; junk mixed with off-season designer stuff, bins to paw through, etc. Some times you find nothing good, other times great (my experience with TJ Maxx as well). The stores are different from the online presence. Yay I was hoping someone would fill me in, thank you so much for the tips, I’m going to use them to update this post. Ah I so regret not checking out Tati! Hopefully I can send a friend heading over to investigate for me. Thanks again for the great info! Do you know if the Alaia outlet has moved? Hi Jenny, I didn’t visit that one personally so not sure. If you find out, let me know!